I made this card using free items from Sale-A-Bration, Stampin' Up! 's biggest promotion where you get one free item for every $50 that you spend. 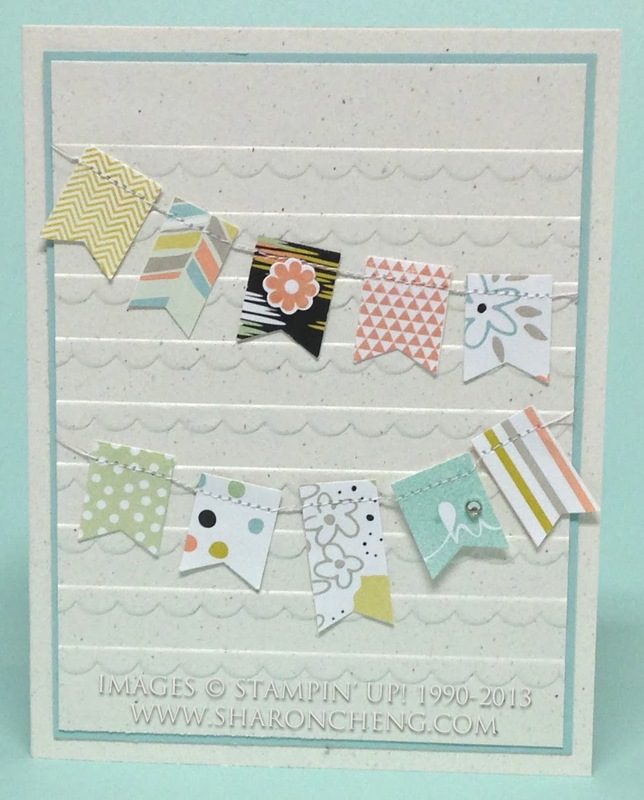 The flags were made using the banner punch, the Banner Blast stamp set and the Sweet Sorbet Designer Series Paper. The card could easily be changed into a baby shower card. It was inspired by several cards on my DIY Valentines Pinterest Board. Did you notice that some of the flags are longer? To make a longer flag, you cut a strip of paper that is 1/2" wide. Put it in the punch as shown in this post. Then you can cut the banner to make it the length that fits your project! Sale-A-Bration always brings back fond memories for me. I went to my first Stampin' Up! workshop during this promotion. I remember putting together my $50 order so I could get my free stamp set. I was hooked and signed up as a Stampin' Up! demonstrator in April 2005. That was almost 9 years ago and I still enjoy rubber stamping! I just have a whole lot more Stampin' Up! friends. During Sale-A-Bration, new demonstrators get a special with their $99 starter kit. They can choose $150 of Stampin' Up! products of their choice. I'll be posting more Sale-A-Bration projects this coming week. Sale-A-Bration goes from January 28th through March 31st.